Review published in IJPE, Vol. 7, No. 4, July 2011, p. 400. As indicated in the foreword of the Series Editor Huang Pham, this is a good source book on the theoretical foundation of the fundamentals of reliability, availability and safety. 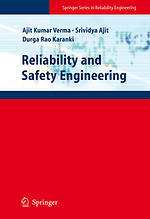 In fact it gives reviewer pleasure in reviewing this book whose two authors (Verma and Rao) out of the three authors have been his students at Reliability Engineering Centre at Indian Institute of Technology, Kharagpur, where they did their doctoral and postgraduate degree in reliability, respectively. There are several excellent books available on the subject of reliability and safety but dealing in a unified way is the principal merit of this book. This is all the more desirable and necessary as the much of the methodology used in these two areas is common. This book does full justice to this aspect by discussing them explicitly. Another plus point of the book appears to be its discussion of uncertainty measures in evaluating reliability, availability, risk or safety. The present book covers these aspects as well. The treatment of mechanical systems and structural reliability of course could have been presented in a unified way since both use probabilistic approach for design. But this does not restrict the book’s utility and the reviewer finds separate an adequate coverage of these systems in this book. As modern complex system operation is both hardware and software dependent, the book also covers software reliability as well. This reviewer would like to recommend this book as an introductory text for undergraduate as well as graduate students. The book treats a variety of problems in uncertainty consideration including load uncertainty and structural variability/imperfections. The simple language used in the book and the numerical examples provided shall make this book a good source of learning for under graduate students. Review published in the International Journal of Performability Engineering, Vol. 7, No. 4, July 2011, p. 400.